When we were planning our Autumn releases this year we wanted to design something that was truly spectacular. Our artist Ginny did a wonderful job of painting the covered bridge scene. 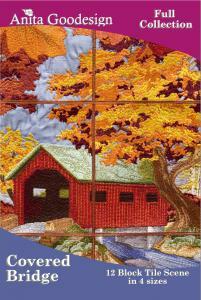 The covered bridge is surrounded by beautiful fall foliage and the whole scene is framed with fall leaves. There are a few fill patterns in the design, but for the most part each of the elements were completely shaded by hand. The designs come in four different sizes, the smallest is for the 5"x7" hoop and the largest is for those of you who have a new machine with a hoop that is 8" wide! The 8" blocks create a huge scene for those extra large walls! We also instruct you on fabric choices and some tips and tricks for no hassle embroidery. We hope you love the Covered Bridge tile scene.